There are two bands called Kingdom Come. See also Arthur Brown's Kingdom Come (though they were only called this in the US, and all of their album covers list the band name as simply "Kingdom Come".) German Hard rock band Kingdom Come, formed in 1987 by vocalist Lenny Wolf in Hamburg, Germany. After the release of their first single 'Get It On' fans mistakenly regarded the band as a Led Zeppelin reunion. Although the bands had a great deal in common Lenny Wolf pursued his own vision of hard rock. 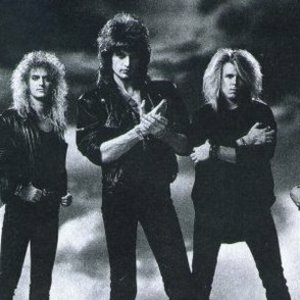 German Hard rock band Kingdom Come, formed in 1987 by vocalist Lenny Wolf in Hamburg, Germany. After the release of their first single 'Get It On' fans mistakenly regarded the band as a Led Zeppelin reunion. Although the bands had a great deal in common Lenny Wolf pursued his own vision of hard rock. Kingdom Come is a melodic hard rock band fronted by Hamburg-born vocalist Lenny Wolf. The group's first album, Kingdom Come became quite popular and is remarkable for its classic hard rock sound, reminding listeners of such bands as Led Zeppelin and Scorpions, the latter of which former Kingdom Come drummer James Kottak is now a member of. Kingdom Come's sound was thought by many to be highly derivative of Led Zeppelin's, to the point that some listeners initially thought that Kingdom Come was actually a Led Zeppelin reunion. In 1988, Lenny & company released their debut LP, Kingdom Come. They toured in England supporting Magnum on their Wings Of Heaven tour during that year. Quickly, the band were directed by management and Polygram to get a new recording available. In 1989, Kingdom Come released their next LP, called In Your Face. However, the subsequent backlash against the band's perceived appropriating of the Zeppelin sound (earning them the derisive moniker "Kingdom Clone") hurt their commercial appeal, and after the band's second album failed to sell well, all members other than Wolf quit the group. Stag went back to Pittsburgh and immersed himself in blues and classic rock projects. Steier and Kottak went back to Kentucky and assembled the short-lived Wild Horses, who released a poor-selling album on Atlantic Records. Both would later resurface in Warrant. James Kottak is now in Scorpions. Frank has kept a very low profile for the last few years. With a new lineup, Kingdom Come managed one more international release on Polygram (Hands of Time). By 1993, Wolf had returned to Germany to regroup. With a new, mostly-German lineup, Kingdom Come remains active with several subsequent releases and tours in Europe under their collective belt. After Bad Image Lenny Wolf released Twilight Cruiser, Live & Unplugged, Master Seven, Too. These albums were recorded in the best traditions of hard rock: great riffs, touching ballads, wise lyrics. The next artwoks Independent and Perpetual are very good albums, too; their sound became more 'industrial' and cosmic. The newest album released by Kingdom Come is Ain't Crying For The Moon, and the latest tour was in November of 2006 through the Russian Federation. Lenny Wolf: "If you like a lot of emotions, acousticly, industrially and heavy try Kingdom Come. If you like it tell your friends, if not --"